The coral hairstreak is a small butterfly of July, with a wingspan barely more than an inch. The row of coral spots along the edge of its wing distracts predators – such as birds – from vital parts such as the butterfly's head and body. Like other butterflies, the coral hairstreak has club-like swellings at the ends of its antennae. These clubs are helpful in telling butterflies apart from moths, which usually have feathery antennae without clubs. Butterfly season usually peaks in the first two weeks of July, but all of July is a good time for enjoying summer butterflies in Westborough. Large, colorful butterflies often come to mind when we think of butterflies – monarchs and tiger swallowtails – but many of the butterflies fluttering in our gardens, fields, and woods are small. They may have wing spans of only an inch or so. 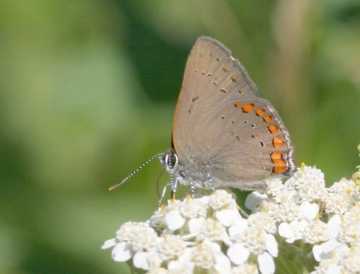 One small butterfly in our area in July is the coral hairstreak (Satyrium titus). It is tan with a row of bright coral spots along the edge of its hindwing. It flies quickly but you can look at it carefully when it settles on a flower or foliage, with its wings held upright above its body. In this position you can see the row of orange spots. July is good for butterfly watching with so many flowers in bloom, both in our gardens and in the wild. Their nectar attracts many different kinds of butterflies, which need this nourishment to fly around, mate, and lay eggs. Butterflies sip nectar with their tongue, or proboscis. It works somewhat like a straw and is coiled up when the butterfly is not using it. Coral hairstreaks have relatively short tongues, so they do best with flowers that aren't too deep, such as milkweeds. Besides offering nectar, flowers that are good for butterflies have landing pads – clusters of small flowers, large petals, or daisy-like flowerheads. They also sport bright colors and grow in clumps or colonies, making them easy for butterflies to notice. Coral hairstreaks are strongly attracted to butterfly weed (Asclepias tuberosa), a bright orange native milkweed that is popular for butterfly gardens and grows wild in the sandy soils of the Cape and southern Massachusetts. The many lenses on the bottom half of the eye give butterflies close vision. Unlike humans, butterflies can see ultraviolet light, so some color patterns on flowers look different to them than they do to us. The scent of nectar helps to guide butterflies to flowers. It's no surprise that the height of butterfly season comes in early July when common milkweed (Asclepias syriaca) is in bloom, with its heavily scented nectar. Butterflies are better equipped for smelling and tasting than we are. Not only do their tongues and antennae bear chemical receptors for taste and smell, but so do their feet! Butterflies are closely tied to the natural landscape, especially plants, throughout their life cycle. Besides needing flowers for nectar (or trees for tree sap), butterflies need to lay their eggs on particular plants. The next generation – in its immature form, namely caterpillars – can't eat just any plants. The caterpillars need the right food plants. How do butterflies find the right plants for egg-laying? Adult female butterflies land on plants and taste them with their feet. For the small coral hairstreaks, the right plant is a wild cherry, wild plum, chokecherry, or related plant (Prunus species). The caterpillars feast on the developing fruit and transform into butterflies in July. Butterflies also depend on the natural landscape for shelter, especially during the winter. Different butterflies overwinter in different stages of their life cycle. Most butterflies overwinter as caterpillars, dormant and often encased as a chrysalis in a protected place. Coral hairstreaks overwinter as eggs, laid on twigs or near the base of a wild cherry or plum tree. A few butterflies, such as mourning cloaks, spend the winter as adults, dormant in crevices in tree bark (see Nature Notes of April 29, 2005 on the WCLT web site). What kinds of places are good for seeing butterflies? Look in open, sunny areas. Fields, wet meadows, gardens, powerline cuts, and woodland edges are good places. Places near food plants for caterpillars are promising. Westborough's fields and woods have food plants for many kinds of butterfly caterpillars, ranging from milkweed for monarchs, wild cherry for coral hairstreaks, spicebush for spicebush swallowtails, and willow for mourning cloaks, to clover, birch, dogwood, sumac, viburnums, and many types of grasses for other kinds of butterflies. Look down as well as around when you're watching for butterflies. Mud puddles attract butterflies, which go there for salts they need during reproduction. Some butterflies also feed on rotting fruit or dung. Where to go in Westborough? Try the trails through the fields at Mass Fish and Wildlife (off Rt. 135). People who attended a July 1 WCLT butterfly walk there saw 10 different kinds of butterflies. Two-thirds of these were small or medium-sized butterflies. According to Dolores Price of the Massachusetts Butterfly Club/North American Butterfly Association, who led the walk, it's possible to see up to 20 kinds of butterflies at a good spot on a good day in mid-July. Another promising areas in town is the Andrews Street entrance to the Headwaters Conservation Area, where the WCLT butterfly garden is located in fields with sumac, cherry and milkweed. Check the fields at the Bowman Conservation Area and Minuteman Park, near the community gardens behind St. Luke's cemetery, and at the Walkup and Robinson Memorial Reservation. Other places include the trails around Gilmore Pond, the recently restored meadow at Bowman West, and the powerline cut on the trail to the WCLT Hero property off Haskell Street.